Set of Four Medium Stainless Steel Spirit Cups in Leather Case. This set of 4 stainless steel spirit cups by Brady is a very traditional gift for outdoor sportsmen, whether they pay golf or go out shooting in the wilds of Scotland. 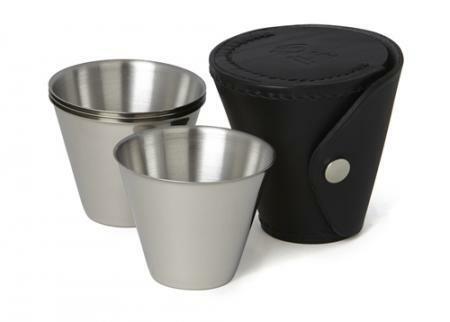 Ideal for sharing whisky, brandy or any other tipple with friends, this set of 4 medium cups (60mm high, top diameter 65mm) comes in a sturdy brown or black leather case with secure press stud fastening.